After the fire is put out and the fire damage put under control, you are left with lots of ash, soot, and overall smoke damage. 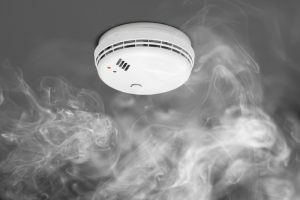 Many homeowners make the mistake of trying to deal with smoke damage on their own, while they should leave it to trained professionals. The problem is, if smoke damage restoration isn’t done thoroughly and professionally, worse things can happen than your home smelling of smoke. Let’s consider why smoke damage should be curbed by fire damage restoration professionals. There are cleaning products used exclusively for restoration, and they can’t be purchased at your local retail store. These products include HEPA filters and HEPA vacuums, and their efficiency goes beyond simply wiping the furniture, draperies, and walls with over-the-counter cleaning products. Experience and know-how are essential for an effective restoration campaign. Nevertheless, reliable professionals are also certified by relevant institutions, such as The Institute of Inspection Cleaning and Restoration Certification (IICRC). The IICRC sets the standards for the industry and provides information on the most efficient restoration techniques, equipment, and products. In addition to the visible smoke damage, there is the kind of damage you cannot see, even though you can feel the smell. For example, smoke odor can penetrate porous and fibrous materials such as clothes, furniture, linoleum, and countertops, to mention a few. An expert on smoke damage restoration will know how to quickly identify the hidden damage and adapt various techniques for odor removal and air scrubbing to restore your belongings and property to their sanitary state. Large-scale fire damage may have stretched all the way to your property’s structural elements. In this case, the affected areas of the property need to be demolished and then rebuilt, which is a large-scale undertaking. Full-service restoration contractors often work with construction and building contractors to make sure all traces of fire damage are rooted out and your property’s structure is not compromised. Just like a fire can damage the structure of the property, so it can affect the HVAC system. Both the HVAC units and the ductwork may need repair or even replacement. Before any of it is done, a thorough fire damage inspection needs to be conducted to accurately identify any smoke, soot or ash residue. In some cases, a thorough cleanup is enough, while in others, the only way to secure the health of your family is to replace parts of or the whole ductwork. In some cases, fires leave us with no choice but to dispose of some of our most valuable possessions. It may be a piece of furniture, family heirloom or any other personal possession that you would rather restore than dispose of. In this troubled time, you may not be able to think clearly. That’s where trained professionals should accurately assess which of the items can be restored and which need to be disposed of to keep your home clean and sanitary. KIC Restoration is an IICRC-certified firm, boasting a team of seasoned technicians that apply tried-and-tested fire damage, smoke damage, odor removal, ash and soot restoration techniques to restore your property to its sanitary state. We are a full-service contractor with an impeccable reputation for fire damage restoration in San Diego County. Contact us for superior workmanship and unrivaled customer service!